It's still raining here. Just never seems to stop. Yesterday was a pretty miserable day and very, very wet. The weather seems to be affecting my mood. Feeling very down and fed up. Also got that Monday morning 'I'm exhausted and glad everyone's out of the house and I can relax and knit feeling' except I've not been relaxing or done any knitting today. I have been trying to cheer myself up by dyeing some more yarn though. On Saturday I stuck mainly to pastels but today it got brighter. I decided some bright colours would cheer me up. We've got 'peaches n cream', pinks, purples, blues, greens and some other colours mixed in. All the skeins were dyed in different colours. I wanted to do some more lace today but the skeining just takes so long so there was only one 50gr skein dyed today. Tomorrow or Wednesday I'll just do lace though. I promise. The 'Surprise Yarn of the Month' is selling well so if you want in on the action be quick. You've got till Saturday to order and then on Monday I'll be dyeing the yarn and as soon as it's dry and ready it'll be posted to you. See the side bar or Etsy to order. I've listed some more yarns on Etsy today too. There's is this gorgeous batch of 'Strawberries n Cream', 'Marshmallows' and a bit of 'Cloudy Sky' - not as cloudy as the skies outside here today - just a soft blue sky with some white clouds bubbling up. Be quick if you fancy some of it as some sold within minues. Those are some beautiful yarns you've been dyeing. I only wish I had enough money in my bank account to buy a skein or two! Wow! Anni! You definately have an eye for dying beautiful yarns! I love the colors. Don't be too upset by your raining weather. I'd give almost anything for it to be rainy here! It's been in the upper 90's to 100 degrees everyday for a couple of weeks, a little windy to really dry things up and it is miserable! Please send us some rain! Oh, I really wish I didn't have to save my money for going to Korea! 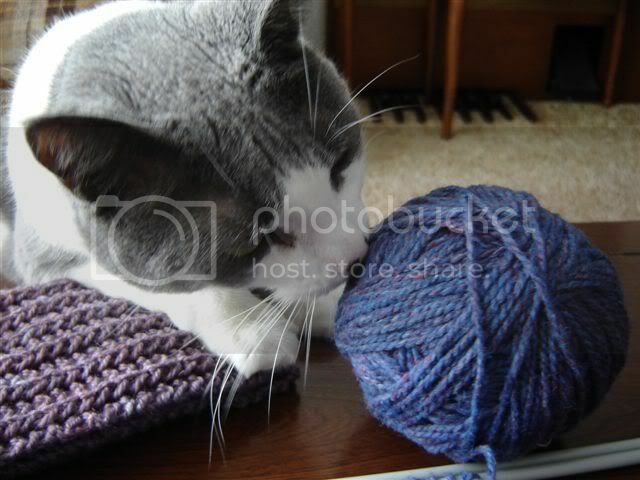 You've got some beautiful yarns that I love and would love to get! Anni, your colours just keep getting better! I love the Strawberries and Cream (off to have a browse in a sec). I'm sorry to hear you are feeling low, but agree with you that the weather is not helping. Sending *hugs* and much thanks for your kindness, I hope your day gets better.